Miss South Carolina Bree Boyce once weighed more than double her current 112 pounds. Miss South Carolina Bree Boyce has her eye on the Miss America tiara, and now that she's 122 pounds slimmer, she might have a shot. Boyce, who weighed 234 pounds five years ago, now weighs just 112 and hopes to be an inspiration to overweight girls everywhere. Every Friday, Bree Boyce dreaded her high school gym class. Students had to run a mile under 11 minutes, and those who couldn't finish in time would have to walk around the track for the rest of the period. She still recalls feeling low self-esteem in high school, when she wore a baggy T-shirt and size 18 jeans, always afraid of having her picture take. "I had struggled for so many years with my weight," Boyce told CNN. "So many girls look to beauty queens because they want to be like them and look like them. But my thing is that we're all unique and we're all different and not one person is going to look like the next. And somebody might be a healthy size 6, and an unhealthy size 0." Boyce, who will vie for the Miss America crown in January in Las Vegas, said she always made jokes to deflect attention from her obesity. She found acceptance through her personality, but yearned to be a healthy weight..
"I tried to be very outgoing and tried to compensate my weight with my personality," Boyce said. "It was all trying to cover up and not try to expose myself too much that I was hurting inside about my weight." Boyce tried low-carb and other fad diets, but nothing worked. After school snacks and fast food became mainstays in her life. "I figured that this was the body I was going to live in, and there was nothing I could do about it," Boyce said. "I was just so unhappy about the way I looked, but I still continued to eat unhealthy." When she was just 17, a doctor told her she needed to drop the fat, and she took his words to heart. She set a goal of losing five pounds in one month and began regular walks around the block. After losing more pounds, she joined a gym and started dancing in Zumba classes. "It's all about learning a process, learning a lifestyle, and so many people think it's an overnight quick fix. And it absolutely is not. It takes time. It took me three years," she said. Now, Boyce plans to run a marathon after the Miss America contest. "I love my body," Boyce said. "I went from 234 pounds to being comfortable and happy and being content with the way I look. 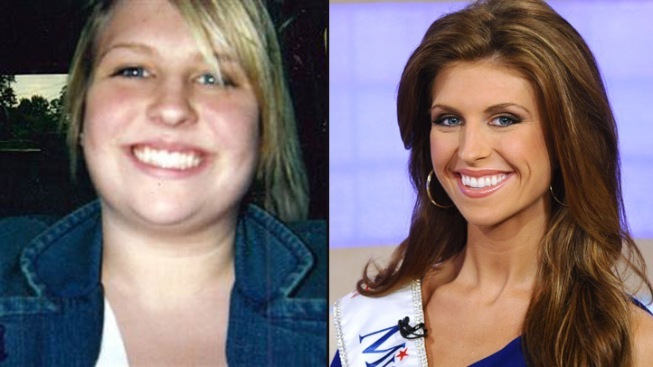 Someone says I'm not a 00 -- that doesn't mean I don't continue to compete for Miss America. We need to give an idealistic role model."